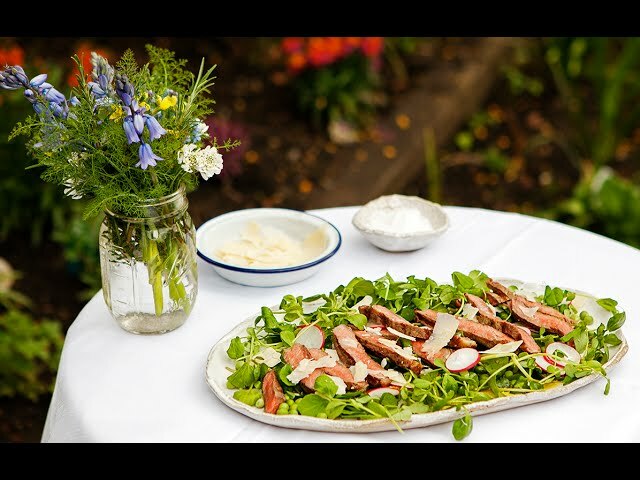 Lisa Faulkner - Steak Tagliate with pea shoot saladSteak Tagliata with peashoots is a lovely summer salad, perfect as a starter or main course. "Tagliata" means thinly sliced. This recipe is simple and quick to make, ready in just 15 minutes. Perfect as a delicious share platter this BBQ season! Cook the steaks on the hottest part of the bbq for 1- 2 minutes each side. Allow to rest on a piece of foil to catch the resting juices. In a jug, whisk together the red wine vinegar, lemon zest and juice and the mustard powder with some seasoning. Gradually whisk in the olive oil then add any juices from the resting steak. Toss the pea shoots, watercress, mint and radishes together with half of the dressing and put on a serving platter. Slice the steaks thinly on an angle, arrange on top of the leaves, scatter with the parmesan and drizzle with the remaining dressing and serve. This recipe is supposed to be served as a sharing platter, but don’t back on anyone being keen to give any away! The most delicious, healthy BBQ recipes are all about taking the very best ingredients available and working them as gently as possible to bring out their natural flavours. With just a handful of ingredients and a hot grill, this gorgeous Steak Tagliata salad makes a sublime summer starter or side dish for your favourite BBQ recipes. Just be sure to make plenty – it tends to disappear even quicker than it’s cooked!